After lunch at the Philippine Military Academy (PMA) cafeteria, Jandy and I again boarded our Toyota Revo and proceeded to Camp John Hay. This attractive, quiet place, with views of the surrounding hills, always offers an abundance of rest and recreation activities such as hikes along a 1.8-km. eco-trail; biking, horseback riding and kiddie rides at Scout Hill; camping, an educational tour of the Butterfly Sanctuary; and golf at its 5,330-yard, 18-hole, par-68 golf course, one of the best in the country. The Camp John Hay Mile-Hi Center, a former recreation center of the Americans, offers local and exported crafts and garments. Within the CJH Commercial Mall, located at the former Administration Bldg., is the John Hay Commissary (a duty-free shop), Strumms, Dencio’s Bar and Grill, Side Bar and Nike Stadium, plus a billiards hall, business center and an internet cafe. There’s also the Camp John Hay Manor and the Camp John Hay Suites, nice places to stay within the camp. A 3-hectare slice of nostalgia within the camp, called the Historical Core, my favorite spot then and now, has been set aside to preserve the camp’s timelessness and allure. Deemed inviolate to the whims and winds of change, this living museum was envisioned as more than just a window on time. It consists of the Bell Amphitheater, the History Trail, Honeymoon Lodge, Our Secret Garden, the Cemetery of Negativism and Bell House. Near the entrance is the Cemetery of Negativism, built during the term of camp commander Maj. John Hightower (1979-1982). A glimpse into the homespun American philosophy of living, here we strolled among the tombstones where bad habits and the scourge of productivity are buried, its touch of whimsy doing little to negate the truth of its message. Among them are the inept Kant du Nutin Wright, the defeatist Ben Trid Bfor and the notorious General Neg A. Tivism (whose epitaph reads “Died of positive reaction to enthusiasm”). The Bell House, now the Camp John Hay Museum (opened on October 25, 2003), was named after U.S. Gen. J. Franklin Bell. Initially built as the vacation home of the Commanding General, today it is the repository of artifacts and other indoor exhibits. Personally designed by Gen. Bell who took inspiration from the Ifugao’s terracing technique, the amphitheater was once a venue for social and cultural gatherings known for its perfect acoustics. Anything said under the gazebo at the center is amplified, audible from any point within the amphitheater. Its rows of chairs have since been replaced and it is now a multi-level landscaped garden with rare flowers. The amphitheater is now available for concerts, weddings and other special occasions. The History Trail, designed to wind its way amidst pine trees, offers landscaped resting areas. Our Secret Garden is planted to blooms that add a splash of color and scents. It also has a gazebo. The Honeymoon Cottage is rented out to newlyweds. While in Lipa City, we made a short visit to the 200-hectare Mt. Malarayat Golf & Country Club where my brother Frank plays golf. This private proprietary club, developed by the Active Group, is nestled at the foot of the mountain range for which it was named. It has a 27-hole, flood-free, all-weather championship golf course designed by Bob Moore of the internationally renowned J. Michael Poellet (JMP) Golf Design Group. It consists of three courses named for peaks in the Malarayat Range -the 18-hole, 6,284-yard, par 72 Mt. Lubo and Mt. 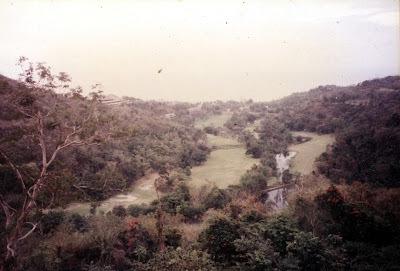 Malepunyo golf courses and the 9-hole, 3,168-yard par 36 Mt. Makulot golf course. The tight and challenging layout is complemented by beautiful scenery. The rough and fairways are Tifton 419 bermuda grass. On the first 18 holes, water hazards are found on Hole No. 1, 7, 8, 9 and 18 and, on the third nine, Hole No. 6 and 9. There are sand traps on the fairways and on the greens. The 591-yard Hole No. 4 is the longest hole. Facilities here include a 40-room hotel adjacent to the golf course, a driving range, practice putting green, clubhouse with restaurant, bar, pro shop, function room, tee houses, lounge, lockers, jacuzzi, sauna, massage areas, gym, boutique, children’s center, equestrian center, indoor sports club (basketball, billiards, darts, badminton, tennis, squash, pingpong and bowling) and golf clinic. Guest must be accompanied or introduced by a member. 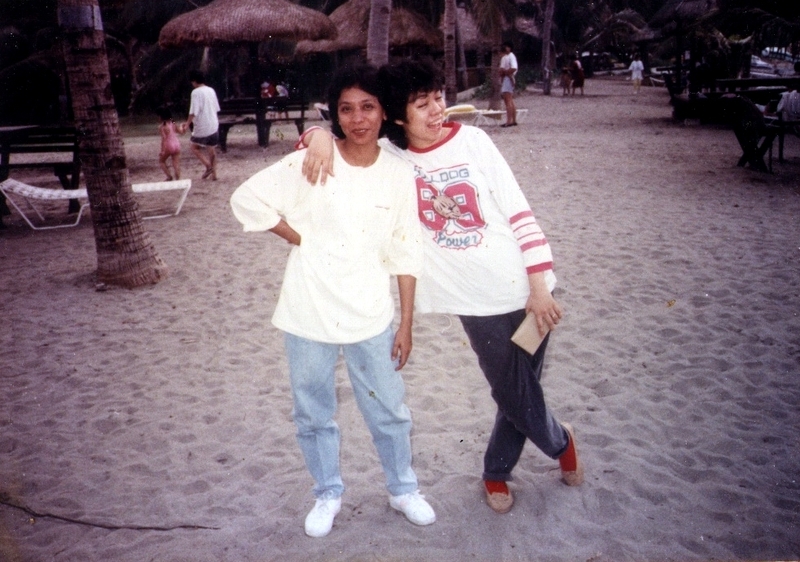 Talisay Sapac & Munting Pulo, Lipa City, Batangas. Tel: (043) 756-7000. Fax: (043) 756-7008. After breakfast at Calapan Bay Resort, we left the city by 11 AM, April 10, for Puerto Galera. Part of the 49-km. 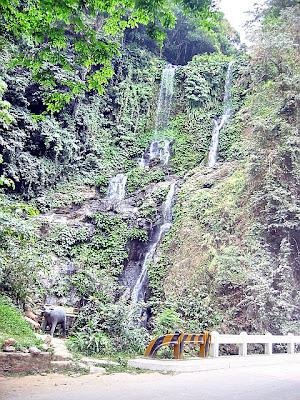 drive entailed negotiating dusty, Kennon-like zigzag roads (Puerta Galera is considered as the “Little Baguio” of Mindoro) and steep ravines. We made a short photo op stop over at the Waterfalls Bridge at Brgy. Villaflor where we can view the 131-m. high, roadside Tamaraw Falls, the highest waterfall in the province. Its pool is a popular swimming spot for weekenders. The enchanting view of Varadero Bay heralded our arrival at the beach town of Puerto Galera which spreads out 10 kms. along the coast. Located on a Y-shaped peninsula on the northwestern tip of Mindoro Island, the popular tourist destination of Puerto Galera has numerous fine beaches with sheltered coves beneath the green mountainous backdrop of the 1,086-m. high Mt. 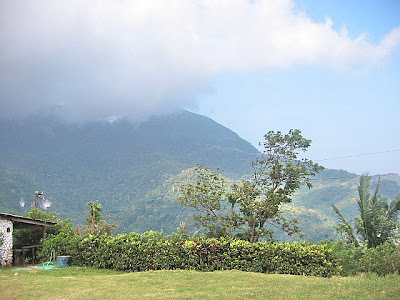 Alinyaban, 1,185-m. high Mt. Talipanan and 1,228-m. high Mt. Malasimbo, all of which are rich in mineral deposits of marble, gold, lime and silica. We arrived at the town proper and its ferry dock at Muelle by 1:30 PM and had a late lunch at one of the restaurants. Muelle has an excellent natural yacht harbor, effectively protected by Medio Island, at the mouth of picture-perfect Muelle Bay. 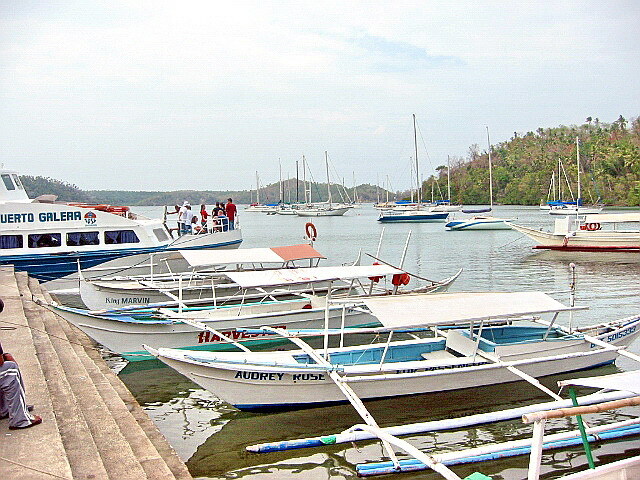 From here, we can view the mooring area of Puerto Galera Yacht Club. 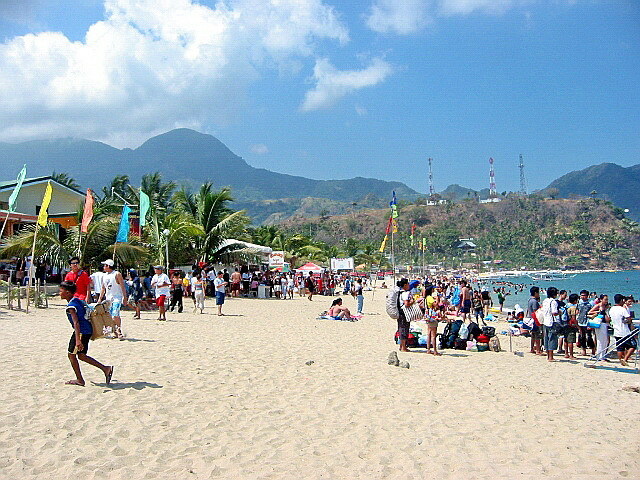 From the pier, Sabang Beach and White Beach are both 6 kms. away. 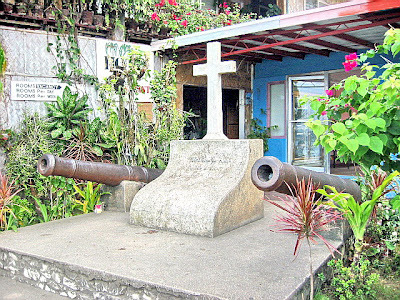 A marble cross, located beside Cocopoint Hotel, commemorates the sinking of the Spanish warship El Canonero Mariveles, on November 18, 1879, during a storm off Soguicay Bay. The cross was originally erected in wood on March 18, 1897 but was renovated in 1938 by Spaniard Luis Gomez y Sotto. Its inscription reads Ultima tierra que pesarou los tripolantes del Canoneros Mariveles el 18 de Noviembre de 1879. After lunch, we made an ocular inspection of Sabang Beach, Small La Laguna Beach, Big La Laguna and White Beach, 4 of the at least 13 superb connected beaches that have been developed for tourism within 7 kms. or so of the town. The somewhat gray sand Sabang Beach has the most developed resorts and offers a good choice of restaurants, discos and watersports facilities. Small La Laguna Beach, sometimes called Coral Beach, has whiter sand and is fairly quiet and cozy. 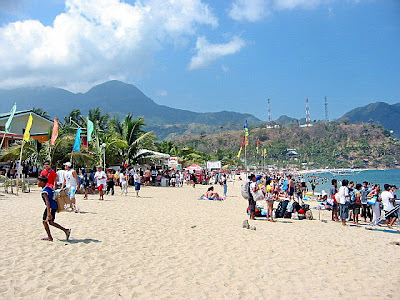 It attracts a lot of foreign backpackers and other budget travelers who like to stay a long time at Puerto Galera. The broad, 1-km. long White Beach, on the other hand, is immensely popular with local tourists. Our last stop, we had our dinner here. After our beach tour, we drove all the way back to Muelle where we decided to check in at fan-cooled rooms with toilet at bath at Coco Point Resort. Breakfast at its restaurant, come morning, was a pleasure as I had a beautiful view of the natural yacht harbor. We checked out right after breakfast and drove 5 kms. (half of it unpaved) all the way up to the 9-hole, 20-hectare Ponderosa Golf and Country Club, located 600 m. above sea level, midway up Mt. Malasimbo in Brgy. 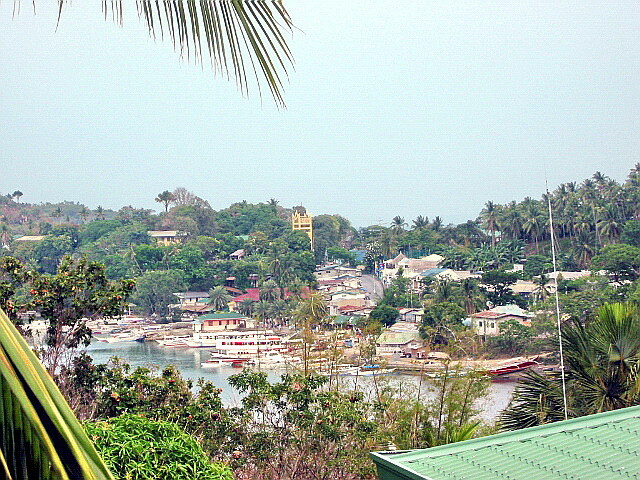 Minolo. 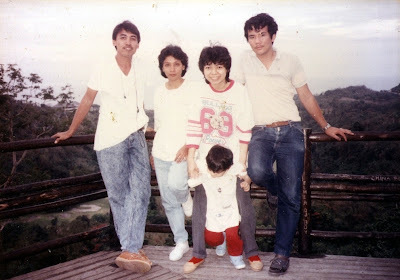 From this cool and windy vantage point, located southwest of Puerto Galera, we had a tremendous bird’s eye view of Puerto Galera Cove and Batangas’ Verde Island, Maricaban Island and Sombrero Island. Facilities here include a restaurant and bar. After about 30 mins., we left Ponderosa by 9 AM, driving back down the mountain and, once back on level ground, made a long stopover at White Beach. It was time to go and we drove to Balatero Pier, 15 mins. from White Beach and near the town proper, arriving there by 11 AM. RO-RO ships dock here and, after paying the necessary fees and fare, we loaded the Ford Explorer on the MV Starlite Odyssey. 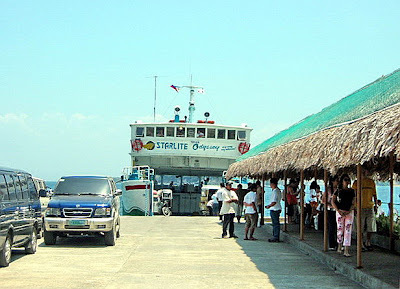 Our ship left Puerto Galera by 12 noon and we arrived at Batangas Port by 1:40 PM. I arrived in Manila by 4:30 PM. From the Palace in the Sky in Tagaytay City, we next motored, via the Naic-Indang Rd., to the town of Ternate where we visited the 1,024-hectare Puerto Azul Golf & Country Club. This 5-star resort, carved out of heavily forested valleys and towering mountains, was developed during the 1970s Marcos era. We first made a stopover at Paniman Beach along Paniman Bay, one of the resort’s 4 gray sand beaches (the others are Caysubic, Cayokno and Palicpican). During its earlier days, this beach used to be covered with white sand said to have been brought over from Boracay, then unknown to the Filipinos. The white sand is now gone, washed away by the tides. From the beach, we next negotiated a steep road to get to its lookout which has a view of the resort’s 100-hectare golf course, a private club open only to hotel guests. One of the country’s most scenic courses, the golf here is surpassed only by views of Palicpican Beach. Designed by world-renowned golfer Gary Player and Ron Kirby, this 18-hole, 6,556-yard, par 72 (adjustable to 71 for big events like the Philippine Open) golf course has a front 9 with rugged terrain punctuated with mountains, pristine rivers and streams while the back nine is close to the sea. The course takes you through jungle, up and over mountains and finishes up on the beach. An elevator takes you from the 6th green up to the 7th tee. The last two tee shots on the back nine are probably the most dramatic. The par 3 17th Hole, the courses’ signature hole, is protected on its left by one of the deepest water hazards in Philippine golf – the South China Sea. The 18th hole is across the beach. Facilities include the nine-hole par-36 Camandag Executive Links, a driving range, tee house, clubhouse, restaurant, bars, locker and shower rooms swimming pool, sauna and massage..
We can also see some of the 17 3 to 4-storey cluster buildings which houses 325 airconditioned rooms. The resort is also home to restaurants, coffee shops, bars, 2 swimming pools, 300-pax ballrooms, 8 60-pax function rooms, business center, jacuzzi, sauna, 6 outdoor and 3 indoor tennis courts, 6-lane bowling center, volleyball/basketball court, two squash courts and 2 nature trails. Though still open, this resort, once dubbed as “Asia’s Paradise Resort” and the “World’s Golfing Capital,” seems to have been abandoned, reportedly due to lack of financial resources to maintain the site. The hotel and cottages are worn out, the beach is dirty and only South Korean nationals use the not so well-maintained golf course. However, Boulevard Holdings, the owner and operator of the site, plans to renovate the existing hotel and build an 8-room boutique hotel and 150-room grand convention hotel. Puerto Azul Golf and Country Club: Brgy. Sapang, Ternate, Cavite. Tel: 524-0026 to 27. Manila sales office: Tel: 844-8541.